26 toll booths and parking meters, and cash needed at all of them! 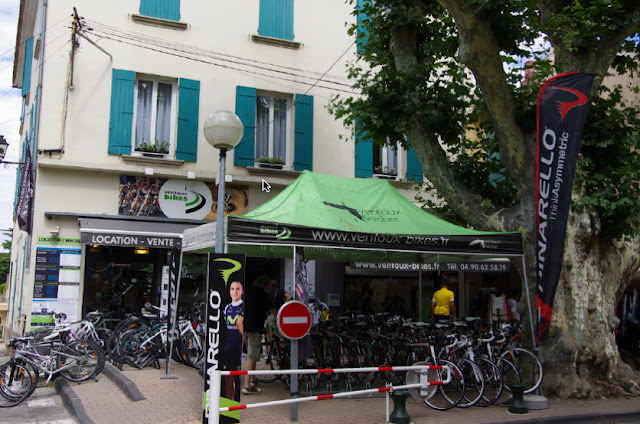 Running into 2 bike tour companies, and having a cafe at a bar in Malaucene with Richard and a pack of BikeStyle clients watching the Tour on TV in a bar. Twice jumping the barriers at the Tour de France and only once getting caught (then hearing the words "dakor, ok" and being released unscathed) (must stop jumping barriers) (tomorrow). 1 lost travel companion - not yet found (Monica remains in Paris where her bag AND bike did not arrive on United Airlines) Boo-hiss. Other than these exciting occurrences, my life as a tourist has been reduced to one simple feedback system - how far and how long can I drive before my Garmin GPS sputters the word "recalculating." Doh, I missed again! That darn GPS gives me immediate feedback when I have done wrong. Why doesn't it give positive feedback? I want to hear "that was amazing, I can't believe you made that turn! Wow, you are an awesome American driver in France!" I mean can I really go wrong? 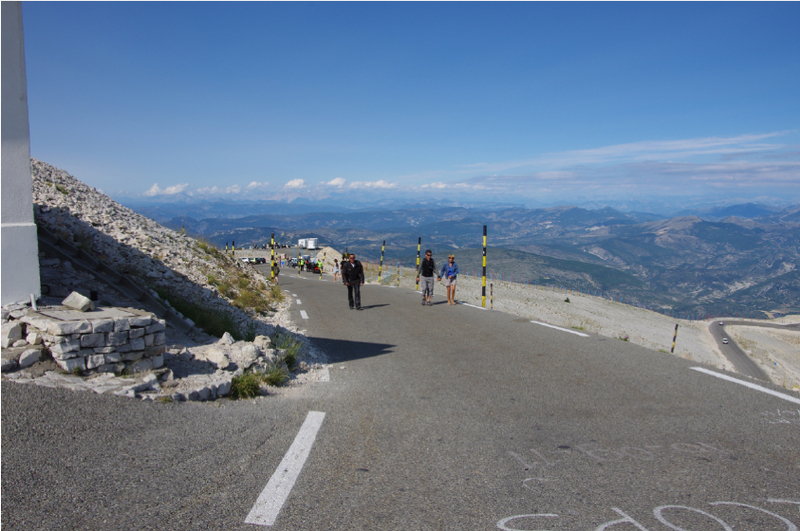 I am in France - left is beautiful, right is beautiful, and every road leads to a patisserie. Forget that itinerary I wrote the other day BEFORE leaving on my trip, because none of it has happened as expected. Not that that is bad, just unexpected. Today I had a nice breakfast and guessed my best at both French and Dutch over the breakfast conversation at my bed and breakfast. I then went to the start of Stage 13 in Saint-Paul-Trois-Chateau (try typing that into a GPS) where I had expected (there is that darn word "expected" again) to see the caravan and sign-in stage but instead found myself among the teams yet again. The time flew by as a fan and I marveled at how the French fans will ditch their car at the first noticeable parking spot on a country lane and begin a 9 km trek to a stage route. They do this all the time, really, and I had to follow. All the while questioning with my American cut-in-the-front of the line mentality why we hadn't parked 3 km away. 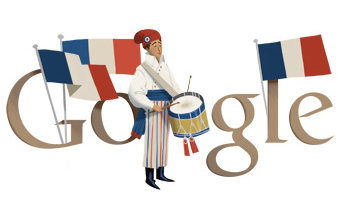 But this is status quo here in France and my feet can attest. After the stage (and finding lunch, gas and an ATM) I drove to Malaucene, a city at the base of Mont Ventoux. 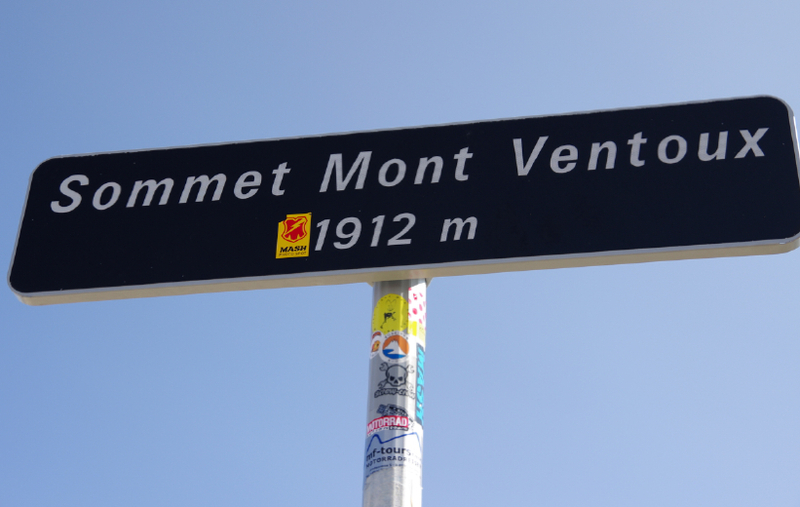 I was originally planning (a close cousin to aforementioned expecting) to ride up this route to the summit, since I have yet to do this side of the ascent, but later changed my mind and decided to do it in two days time from the Sault side. Today I drove, which ended up being an excellent decision because that is one steep road from Malaucene. 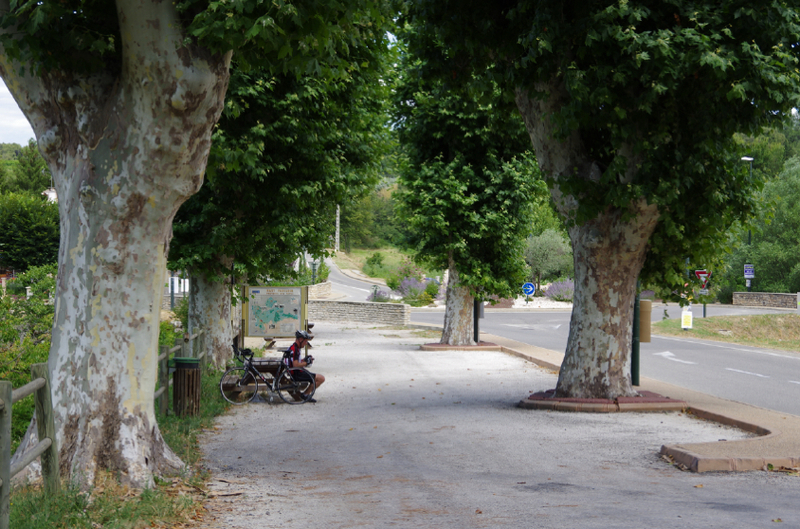 However if the Tour de France ever goes up this side again, the shade of the numerous trees would be an excellent place to watch the riders pass by. 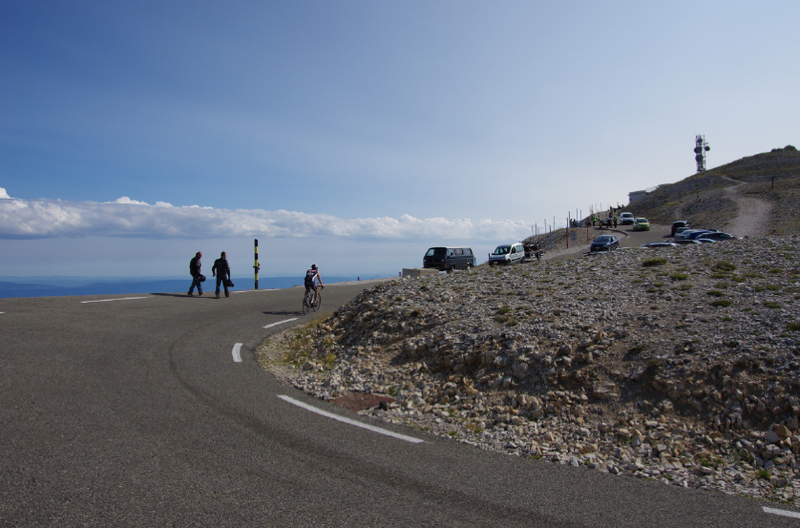 I saw frequent cyclists on the beautiful roads near Mont Ventoux. A cyclist rests under the plain trees. 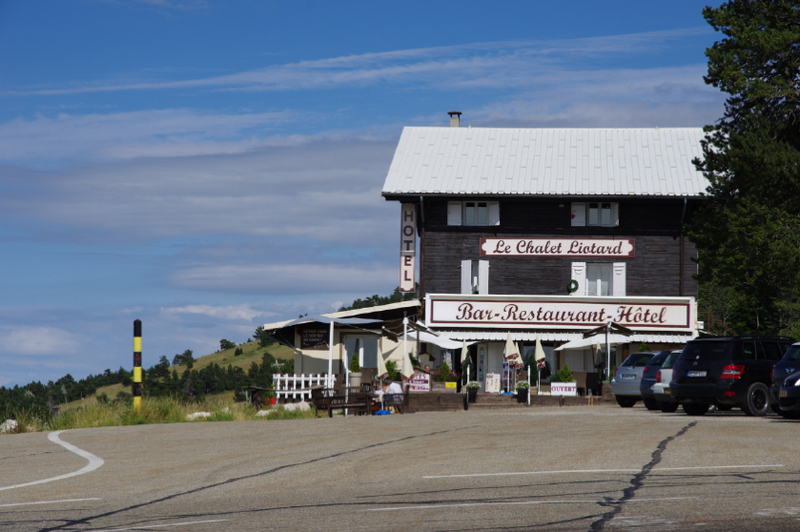 Le Chalet Leotard, the cafe on the north side of Mont Ventoux (the cafe of Chalet Reynard serves the juncture of the south side climbs from both Bedoin and Sault). Malaucene side of Mont Ventoux. Only the very top is deforested. Most of the route has trees. 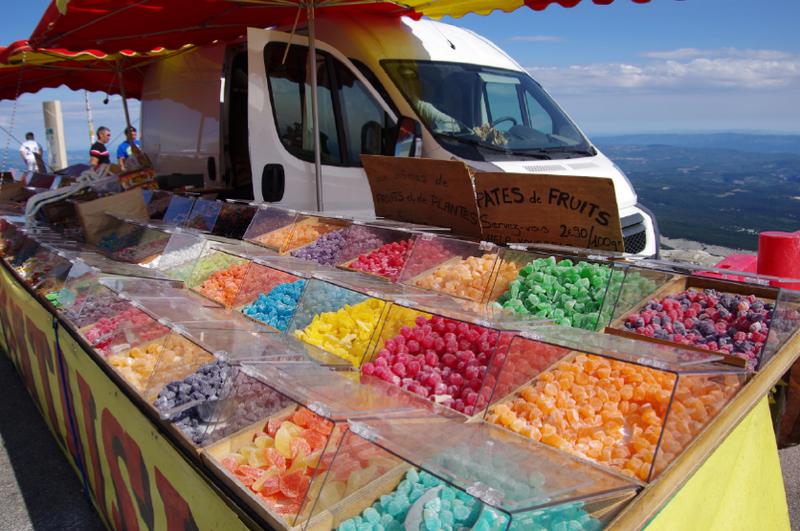 I am pretty sure these same candies where here when I first climbed the mountain in 2003. 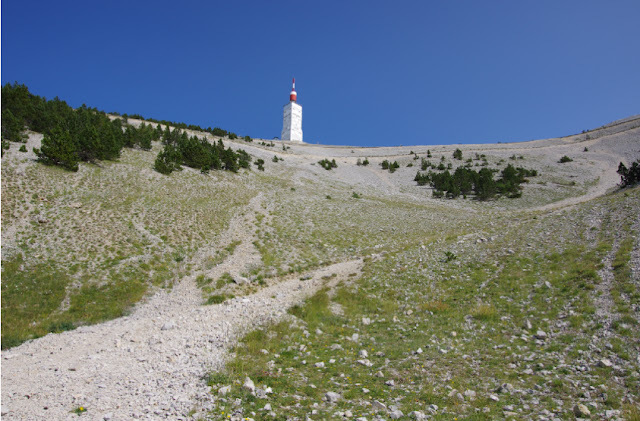 Looking down the more traditional route on the south side on Ventoux (both routes from Bedoin or Sault) use this last few kilometers approach. 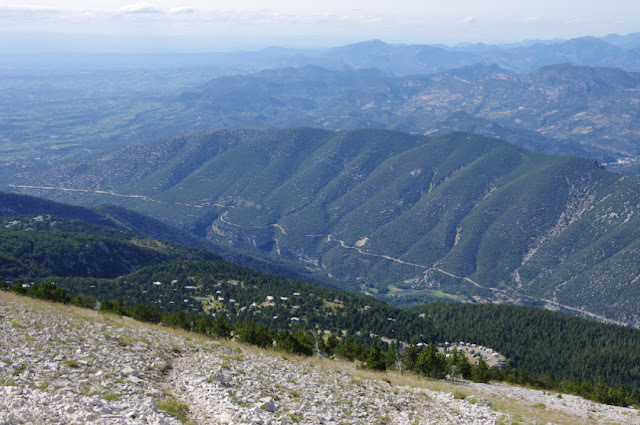 Of the three climbs, I would recommend first trying the Bedoin climb, although the ascent from Sault is my favorite. Why? 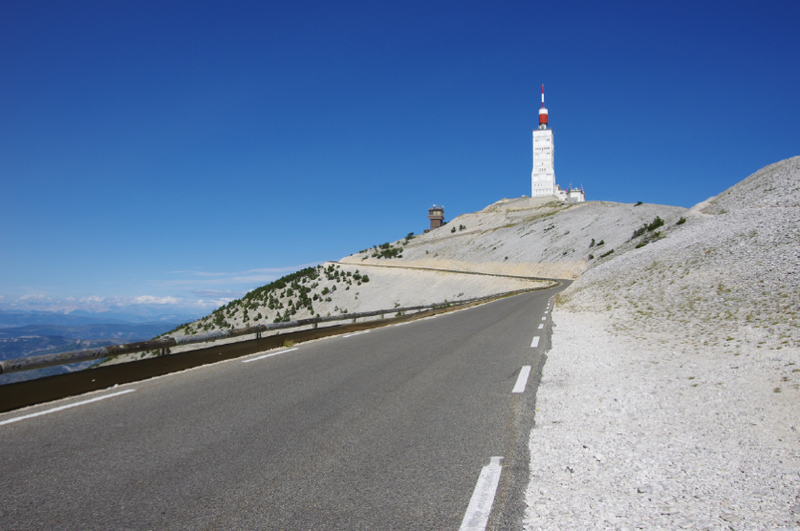 Because many of us have an ideal image of what Ventoux should look like and feel like, so stick with tradition. Also the Tom Simpson memorial is on the south side (past the cafe). 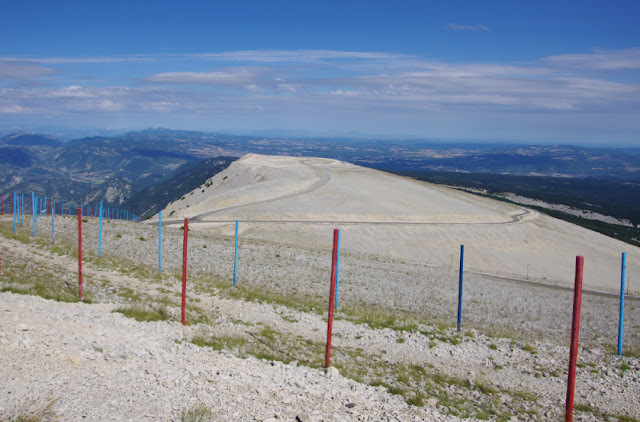 Both of the roads from Bedoin and Sault meet at the Chalet Reynard and finish in these final stone filled switchbacks shown above. Both are great rides. After my visit to the summit, I rushed to Avignon, only to discover that Monica was not on the expected TGV train from Paris. I then endured the congestion of Avignon on Bastille Day before finding my latest hotel for the night. 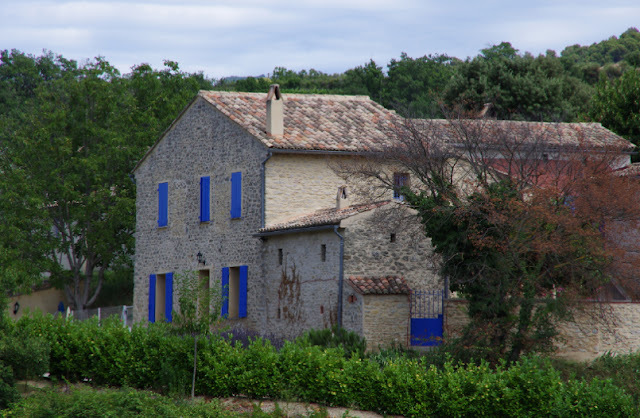 I had purchases a fine bottle of Domaine Brusset Cairanne white wine yesterday in Gigondas, which is delicious after a long day on the road. Don't worry too much about Monica, last I heard she was at a nice hotel in the Place de Concord in Paris sipping champagne with a nicoise salad and frites enjoying the extensive fireworks in Paris on Bastille Day.United and Lufthansa have no clue where her bags are.